Goldman Asks "Have We Reached Peak Cash?" In several major economies it's crunch time for the future of cash. Goldman Sachs notes that this is largely policy-driven: tangible steps are being taken to wean economies off cash (e.g. India, Europe); but adds that, at the same time consumer expectations around convenience are rising and enabling technologies have proliferated in the shape of contactless cards, mobile wallets, cryptocurrencies and more. So, they ask, does the decline in cash payments imply the demise of cash? Technology has been an important catalyst for shrinking cash usage, but it is by no means a new phenomenon. As we wrote in 2012 (see Issue 42, Fortnightly Thoughts: Money, money, money in a mobile world, October 2012), the first technological step-change in the payments arena was the shift from cash to plastic money, i.e. credit and debit cards, which happened in the 1960s. There are many parallels to be drawn between that period and the ongoing shift to digital money: an initial period of an increasing number of providers was followed by a consolidation stage that established a few players (Visa and MasterCard primarily) as the industry standards, eventually accelerating the adoption of plastic money. However, the availability of technology alone has not ensured the demise of cash. As the following chart shows, there are several advanced economies in which it is still the dominant mode of payment in volume terms (surprisingly quite a few European countries are in the bottom left quadrant). Japan is a striking example of this; lots of tech and lots of cash. The US also stands out, and this could at least partly be attributed to the fact that regulators in the US have explicitly stated that the market should manage the shift to digital payments by itself. On the other hand, Scandinavian countries are on the cusp of becoming some of the first cashless societies, as a result of industry-co-ordinated steps and government initiatives. Swish, a payment app developed jointly by the major Swedish banks, has been adopted by nearly half the Swedish population, and is now used to make over nine million payments a month. About 900 of Sweden’s 1,600 bank branches no longer keep cash on hand or take cash deposits and many, especially in rural areas, no longer have ATMs. In conjunction with that, cash transactions were just c.2% of the value and 20% of the volume of all payments made last year (down from 40% five years ago). Denmark’s move to a cashless society is a deliberate result of policy, with the government removing the obligation for some retailers to accept payment in cash. Without this legislative push, we believe cash is very difficult to disrupt and substitute. After all, it is a free and convenient mode of transacting. So far, the selling point of the most broadly used alternatives to cash (cheques and cards) is greater convenience. 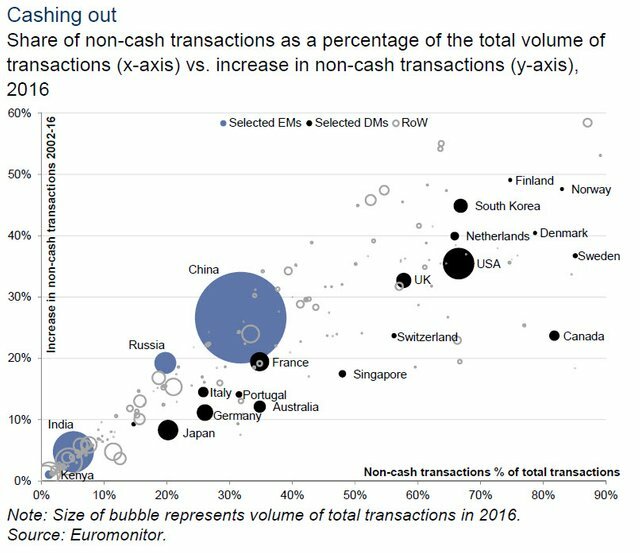 But that hasn’t been sufficient to meaningfully reduce the market share of cash in countries outside Scandinavia and Canada. But why do governments want less cash? The three key stakeholders in this argument, governments, businesses and consumers, all have varied benefits from shifting away from cash. For businesses, it should result in lower cash handling costs, streamlined operational costs (e.g. accounting, taxes) and increasingly, a better understanding of their customers and their operations, via data analytics. Our US financial services analysts argue that customer data, when combined with loyalty programmes, could deliver a sales lift of 2%-5% for merchants. Leveraging detailed data on individuals, to precisely target advertising and offers and thereby driving incremental sales and repeat purchases, is increasingly key to defend against competition. Starbucks and Ulta Salon are good examples of two companies that have leveraged loyalty programs to support top-line growth recently. The flipside for consumers is loss of anonymity and privacy. But as Aakash Moondhra of PayU argues, these concerns are often compensated for by greater convenience and, in EMs, greater access to formal financial services channels. For example, in many African economies, it is the lack of widespread banking infrastructure and high remittance costs that have driven the rapid adoption of mobile transactions. The often cited example, M-Pesa, accounts for more than 95% of the mobile-money market, with the value of transactions flowing through its system equivalent to c.40% of Kenya’s GDP. Put simply, in several of its markets in Africa, consumption growth is being driven not just by growing disposable income, but more importantly, also by freeing up frustrated demand via mobile money. One of the underrated advantages of cash is that it ensures anonymity; but it is difficult to say how much loss of privacy has hindered the growth in digital payments. The emergence of cryptocurrencies may be evidence that there is demand for a digital medium that ensures privacy, but their adoption remains very limited. The advantages of moving away from cash are perhaps the most pronounced for governments. Electronic transactions allow for greater transparency, which in turn leads to greater formalisation of the economy and higher tax revenues. This lies at the centre of India’s demonetisation efforts, when the government pulled approximately 85% of currency in circulation in order to reduce unaccounted and counterfeit money in circulation. Demonetisation in India was also carried out parallel to broader measures being taken to encourage households and businesses to electronic and digital transactions, in order to reduce friction costs and improve ease of doing business. 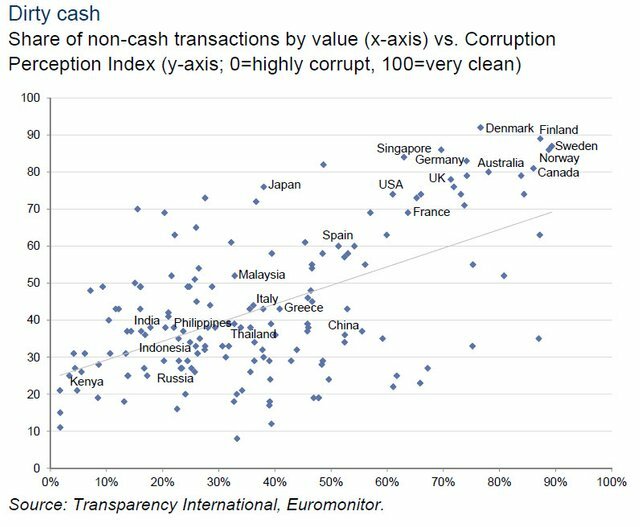 The following chart shows the share of cash transactions vs. the Corruption Perception Index, which makes a similar case for moving away from cash. For policy makers, another advantage of limiting the use or circulation of cash is becoming increasingly relevant; less cash in the economy increases the effectiveness of monetary policy. Currency and monetary policy are intrinsically linked, as without the ability to set negative rates on currency, rates are limited by the zero lower bound (Ball 2014). Cash provides the opportunity to lock in a 0% nominal rate of return, and as such interest rates cannot become more negative than the cost of storing cash, as there is the incentive to switch to paper currency to earn a greater return. However, the costs of storing cash are potentially very large, requiring rates to turn significantly negative before the zero lower bound takes hold. As the following chart shows, despite the rate of deposits held at the ECB turning negative in mid June 2014, usage of the deposit facility has actually increased. Stack up the advantages for the different stakeholders and it is evident that governments benefit most from lowering cash usage. This is why we believe that they will be the biggest catalyst to the shift away from cash. Regulatory intervention will be needed more if the current low nominal interest environment persists. This is because cash in circulation as a percentage of GDP is negatively correlated with inflation. High inflation erodes the value of currency and increases the opportunity cost of holding cash. To conclude, we would argue that as a ‘medium of exchange’, cash has peaked. Why is this? We see three key reasons: (1) increasing ubiquity of technology; (2) the willingness of consumers to use less cash and most importantly (3) policy action. We believe recent government action (for example in India and Europe) demonstrates the rising importance of supportive policy in accelerating the shift away from cash. The benefits for policy makers are clear – electronic transactions allow for greater transparency and better control over monetary policy transmission mechanisms. But the paradox of banknotes means that the decline in cash payments does not imply the death of cash. For more information visit ZeroEdge. Nice read so far. Chopped out a few paragraphs and didn't finish it yet, but will be back! Congrats, @zer0hedge! Thank you for sharing! Very informative. Are you just reposting zerohedge stuff, or are you the real zerohedge combine posting on Steemit?